Do You Have Limited Mobility and Are In Need of a Stair Lift? A stair lift is a convenient way for you to get around in your home if you have limited mobility due to injury, illness, or age. We understand that many people prefer to stay in their homes as they age. That is why we provide lifts that will make all areas of your home accessible. According to statistics, 85 percent of people 50 and over want to remain in their homes instead of going to an assisted living facility, nursing home, or home of a loved one. This is why we are one of the top providers of stairlifts NJ has to offer. The cost of assisted living in Northern New Jersey can cost over $3,000 to more than $8,000 per month. This is why AP Mobility Plus can be a logical and cost-effective choice for many people. We can provide stairlifts for the elderly and injured as well as a staircase lift for the handicapped that will allow one to get up the stairs with ease. The chair lift for stairs also ensures that you can get down the steps without injury. We also provide a temporary chair lift for stairs. This is the type of mobile chair lift for stairs that can be moved in and out of your home if you are preparing for company and want to ensure your loved ones are comfortable. The temporary chair lift is also ideal if you are suffering from a leg or ankle injury and need increased mobility while you heal. If you need to rent a stair lift for any reason, our qualified team will help you select the best item. We will also clearly discuss the terms of the rental so you can keep the stair lift for as long as you need. Because all homes are unique in their own way and staircases can be of a different size and shape, we are happy to be able to accommodate everyone. We install and remove both indoor stairlifts and outdoor stairlifts. We have straight stairlifts for straight staircases as well as curved stairlifts for curved staircases. AIP Mobility Plus is proud to offer a complete package to modify your home using turnkey service. If you or a loved one has mobility issues, we can make the necessary changes to your home. These changes will allow you or your family member to remain in your home and community. This gives you the option to heal or manage your health condition in a comfortable environment so that you can remain in the home and community you love for as long as you would like. AIP Mobility Plus has an extensive line of products beyond stairlifts that will make life a little easier for you and the ones you love. Our team members will conduct a thorough assessment of your home to determine your needs. After we know the layout of your home and the features that are important to you, we will review your plan with you in detail. This gives you the opportunity to request any changes or adjustments before we begin the modification process. After you have agreed to the home plan, we provide you with a written proposal for you to approve. It is a good idea to go over this plan with your caretakers and family members as well. This will keep everyone in the loop about the changes that will take place in your home to increase your mobility. Contact AIP Mobility Plus located in Chatham, Morris County, NJ for your mobility needs. We know that increased mobility brings about a sense of confidence and independence, and we are happy to help make you more comfortable. Our reps are more than happy to assist you. We have chair stair lifts that will make it easier for you to live independently. We will work with you to help you find the right devices that will fit well in your home and be especially comfortable for you. Do not wait. Let us help! 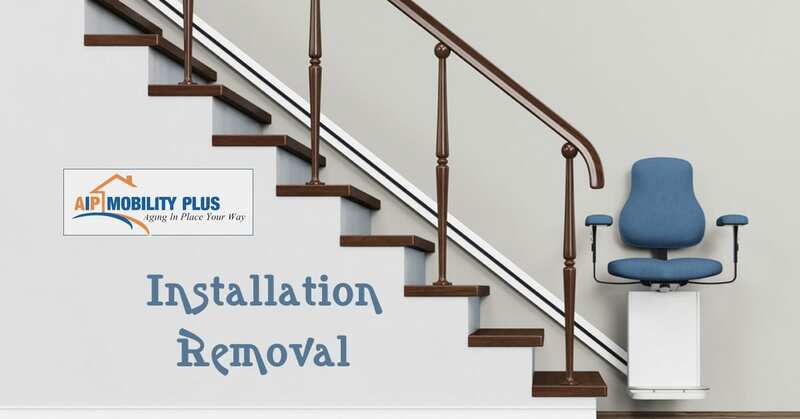 We provide complete packages including stair lift installation and removal. Feel free to contact us by phone, email or simply fill out our easy contact form. Our stairlift team is looking forward to helping you and your loved ones.